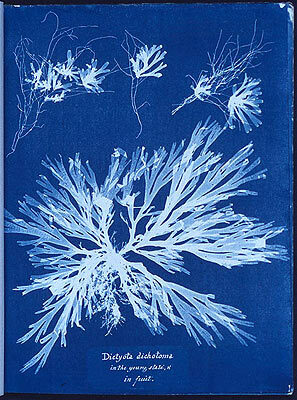 The cyanotype process was one of the first non-silver technologies used to create photographic images. Originated in the 1840's, it was not utilized in mainstream photography and was adopted as a copying technique, becoming known by the term "blueprint", with its blue background reproductions of large architectural and mechanical drawings. To begin the process, two solutions are prepared for the two-part sensitizing process. Material sensitized with the solution is then printed by ultraviolet light. (1) Potassium ferricyanide and (2) Ferric ammonium citrate(green). Too much potassium ferricyanide in the solution will lower printing speed; too little may cause the blue color to bleed into the lighter areas. Basically equal volumes of the two solutions are used. Below are several more commonly used cyanotype recipes. The chemical names are linked to prices, information, and online ordering. Use appropriate safety measures throughout the process. Solutions may be stored for several months in amber glass bottles. Recipe #1: This is the original created by John Herschel in 1842. Ferric Ammonium Citrate 200 gm. Distilled Water to make 1000 ml. Recipe #2: Variation using more concentrated solutions. Ferric Ammonium Citrate 360 gm. Recipe #3: A modern variation. Ferric Ammonium Citrate 272 gm. A fully prepared work area should be organized before the sensitizing procedure begins. A light-safe area is best for sensitizing the fabric, paper, etc. For drying, establish a drying area in a totally dark room. Combine equal amounts of solutions A and B from one of the above recipes. Soak paper or fabric in a tray of combined solutions or apply with a brush. Be sure to make some test strips for later use in testing exposure times. Dry away from light. A clothesline can be hung over an old tub or layers of newspapers to catch drips. A hair drier or fan can be employed to shorten drying time. Dry coating should be bright yellow. Cyanotype is a negative process - areas where light does not hit sensitized material will remain white. Contact print by placing negative on your sensitized material. Expose to strong sunlight or UV light until the high values are a little too dark and the shadows have begun to reverse. You can use test strips to test light to determine best exposure time. Wash in running water until yellow residue is gone from nonexposed areas. The print will still be a weak, silvery blue. As it dries it will oxidize and turn blue. To brighten highlights and more fully develop the blue image, bathe the cyanotype print with a weak solution of household bleach and water (1/32) or 3% hydrogen peroxide. After about a minute in the intensifier bath, remove print and wash in plain water again for 20 to 30 minutes. Dry finished print. Image will generally appear darker when it is dry.